Four years of annual crop production with no herbicide use can drive canola productivity toward zero. However, the good news for producers buying abused land is that canola productivity can recover in one year with adequate weed control. Neil Harker with Agriculture and Agri-Food Canada (AAFC) led a four-year initial input study at five locations in Alberta and Saskatchewan, followed by a two-year recovery study, to determine how quickly canola and barley yields can recover from heavy weed interference. In the initial input study (2005-08), main plots were split between canola and barley. Subplots were given various input treatments, including standard and low input packages and selected combinations – including a treatment with no herbicide and full fertilizer over a four-year period. 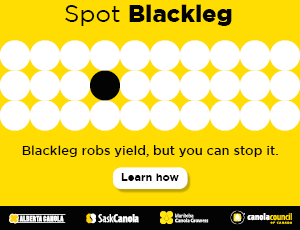 All input strategies were imposed on each plot for a period of four years to evaluate cumulative effects in a canola-barley or barley-canola rotation. After four years without herbicides, weed biomass levels exceeded 2,000 kg/ha in barley and 4,000 kg/ha in canola plots (see Figure 1). Barley was more competitive than canola, with generally lower weed biomass levels in all situations where herbicide was reduced or excluded. Weed biomass levels tended to be highest in plots that received fertilizer in the absence of herbicides, possibly due to better utilization of nutrients by the weeds compared to the crops. After four years of the initial input study, all plots received standard inputs for two years (2009-10) in the recovery study. After standard optimal inputs were restored, barley and canola plots at most sites recovered to optimal yield levels after one year (see Figure 1). The yield recovery occurred despite high weed biomass levels in 2008 and high wild oat seedbank levels (> 6,000 wild oat seeds/m2), which persisted at the end of the study (2010). The study shows that herbicide application can optimize yields in weedy fields despite relatively high weed seedbank levels. Therefore, it is probably more important to optimize yield by managing weeds early in the growing season than to repeat herbicide applications later in the season that may reduce weed seedbank levels and recruitment in the following year. Repeat herbicide applications will definitely increase selection pressure for weed resistance to herbicides. Overall, the negative effects of high soil weed seedbanks can be mitigated if growers use appropriate seed and fertilizer rates to achieve healthy crop canopies, and use judicious herbicide applications to adequately manage weeds. Figure 1. Weed biomass and canola yield. Cumulative weed biomass (line) and canola yield (bars) effects in plots that repeatedly received all inputs but herbicides from 2005 to 2008 (means of five sites). Shading shows weed biomass and yield after standard inputs were restored for one (2009) and two years (2010). 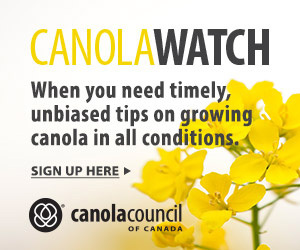 Canola was grown in a canola-barley rotation. Robert E. Blackshaw, Eric N. Johnson, Stewart Brandt, H. Randy Kutcher, and George W. Clayton. (2013). “Weed Interference Impacts and Yield Recovery after Four Years of Variable Crop Inputs in No-Till Barley and Canola.” Weed Technology 27:281-290.